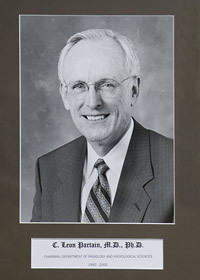 Leon Partain came to Vanderbilt in 1979 with Board Certification in Radiology and a PhD in Nuclear Engineering from the University of North Carolina. In 1982 he followed Rollo as Head of the Nuclear Medicine Division. While Chief of the Division he investigated the coupling of NMR, and nuclear medicine procedures. He published reports correlating nuclear medicine, NMR, and X-ray findings particularly those involving myocardial function. Thyroid studies conducted in this period included I-123 and XRF studies in patients with goiters. His studies included the distribution of labeled eosinophils in mice with inflammatory and parasitic infestations. He also evaluated perfusion of different organs with NMR and radioisotope tracers including studies of brain, and blood brain barrier penetration. He became Chair of the Radiology Department following James’ retirement and served in that role from 1992-2000. After returning to clinical practice in the Department he became Editor of the Journal of Medical Resonance Imaging, and took on leadership roles in the Radiological Society of North America. See further information on the Vanderbilt Radiology Website. Partain, C. L., R. R. Price, J. A. Patton, J. J. Erickson, D. R. Pickens and A. E. James (1981). “The potential impact of digital radiography (DR) on the speciality of nuclear medicine.” Clin Nucl Med 6(10S): P2-5. Heller, R. M., C. L. Partain and A. E. James, Jr. (1982). “Implications of nuclear magnetic resonance imaging for the pediatrician.” Am J Dis Child 136(12): 1045-1046. Hubner, K. F., J. T. Purvis, S. M. Mahaley, Jr., J. T. Robertson, S. Rogers, W. D. Gibbs, P. King and C. L. Partain (1982). “Brain tumor imaging by positron emission computed tomography using 11C-labeled amino acids.” J Comput Assist Tomogr 6(3): 544-550. Mitchell, M. R., C. L. Partain, R. R. Price and N. Karstaedt (1982). “NMR: state of the art in medical imaging.” Appl Radiol 11(4): 19-25. Kronenberg, M. W., R. R. Price, C. W. Smith, R. M. Robertson, J. M. Perry, D. R. Pickens, M. J. Domanski, C. L. Partain and G. C. Friesinger (1983). “Evaluation of left ventricular performance using digital subtraction angiography.” Am J Cardiol 51(5): 837-842. Parrish, M. D., T. P. Graham, Jr., H. W. Bender, J. P. Jones, J. Patton and C. L. Partain (1983). “Radionuclide angiographic evaluation of right and left ventricular function during exercise after repair of transposition of the great arteries. Comparison with normal subjects and patients with congenitally corrected transposition.” Circulation 67(1): 178-183. Runge, V. M., T. H. Rand, J. A. Clanton, J. P. Jones, D. G. Colley, C. L. Partain and A. E. James, Jr. (1983). “Work in progress: radionuclide imaging of indium-111-labeled eosinophils in mice.” Radiology 147(2): 563-565. Sacks, G. A., M. P. Sandler and C. L. Partain (1983). “Renal allograft recovery subsequent to apparent “hyperacute” rejection based on clinical, scintigraphic, and pathologic criteria.” Clin Nucl Med 8(2): 60-63. Dickinson, C. Z., R. H. Christenberry, T. W. Ertzner, T. A. Powers, G. C. Friesinger, M. P. Sandler and C. L. Partain (1984). “Pseudoaneurysm of the left ventricle. Diagnosis by first pass scintigraphy.” Clin Nucl Med 9(11): 625-630. Sandler, M. P., M. W. Kronenberg, M. B. Forman, O. H. Wolfe, J. A. Clanton and C. L. Partain (1984). “Dynamic fluctuations in blood and spleen radioactivity: splenic contraction and relation to clinical radionuclide volume calculations.” J Am Coll Cardiol 3(5): 1205-1211. Sandler, M. P., J. A. Patton, G. A. Sacks, M. I. Shaff, M. V. Kulkarni and C. L. Partain (1984). “Evaluation of intrathoracic goiter with I-123 scintigraphy and nuclear magnetic resonance imaging.” J Nucl Med 25(8): 874-876. Kulkarni, M. V., M. P. Sandler, M. I. Shaff, J. P. Jones, J. A. Patton, C. L. Partain and A. E. James (1985). “Clinical magnetic resonance imaging with nuclear medicine correlation.” J Nucl Med 26(8): 944-957. Parrish, M. D., R. J. Boucek, Jr., J. Burger, M. F. Artman, C. L. Partain and T. P. Graham, Jr. (1985). “Exercise radionuclide ventriculography in children: normal values for exercise variables and right and left ventricular function.” Br Heart J 54(5): 509-516. Patton, J. A., M. P. Sandler and C. L. Partain (1985). “Prediction of benignancy of the solitary “cold” thyroid nodule by fluorescent scanning.” J Nucl Med 26(5): 461-464. Runge, V. M., J. A. Clanton, A. C. Price, C. J. Wehr, W. A. Herzer, C. L. Partain and A. E. James, Jr. (1985). “The use of Gd DTPA as a perfusion agent and marker of blood-brain barrier disruption.” Magn Reson Imaging 3(1): 43-55. Runge, V. M., T. H. Rand, J. A. Clanton, J. P. Jones, D. G. Colley, C. L. Partain and A. E. James, Jr. (1985). “111In-labeled eosinophils: localization of inflammatory lesions and parasitic infections in mice.” Int J Nucl Med Biol 12(2): 135-144.